The Cathedral of the Most Blessed Sacrament, both a parish church and a cathedral church, is the seat of the Archbishop of Detroit and the mother church of the Archdiocese of Detroit. As such, it is the “second parish” of all the Catholic faithful in southeast Michigan, and the “first parish” of some. The Cathedral of the Most Blessed Sacrament is the fifth Cathedral to serve the church in Detroit. The road to 9844 Woodward Avenue includes numerous twists, turns and even a few false starts. Detroit was made a diocese in 1833. Ste. Anne de Detroit, the first church in Detroit, established July 26, 1701, served as Detroit’s first Cathedral church. In 1848 Ss. Peter and Paul Detroit was consecrated and made the cathedral of the Diocese of Detroit. The church was granted to the Society of Jesus in 1877 as part of the foundation of Detroit College, now the University of Detroit Mercy. The building, the oldest surviving church building in Detroit, continues to serve the faithful in downtown Detroit from its location at Jefferson Avenue and St. Antoine. From 1877 to 1890, St. Aloysius Church served as the temporary, or Pro-Cathedral, for the diocese. St. Patrick Church at 124 Adelaide Street in Brush Park was consecrated on the Feast of St. Patrick in 1862 and elevated to cathedral status in 1890. St. Patrick would serve as Detroit’s cathedral until 1938. In 1905, Bishop Foley authorized the construction of a new parish, named Most Blessed Sacrament, on land that was then outside the city limits, north of Grand Boulevard. 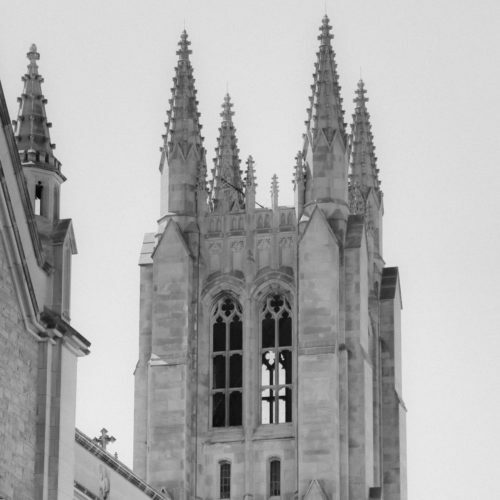 The Norman Gothic design for the church building was drawn by architect Henry A. Walsh, of Cleveland, Ohio. Construction on the church building began in 1913 and was completed in 1915. However, the interior of the church would not be complete until 1930. The church was dedicated on Thanksgiving Day 1930 at a solemn Mass celebrated by Bishop Gallagher. Detroit was elevated to an archdiocese in 1938 and on February 20, 1938, Most Blessed Sacrament Parish became the Cathedral of the Most Blessed Sacrament by decree of Pope Pius XI. The Vatican representative who came to Detroit to inspect the proposed cathedral on Woodward Avenue was Giovanni Battista Montini, later St. Paul VI. Having viewed at first hand the extensive labors of renewal and completion of the Cathedral, I am happy in being able to congratulate you on their felicitous conclusion in time for the scheduled date for the consecration and the contemporaneous commemoration of your silver jubilee of Episcopal Consecration.